Declutter and Organize: My HUGE Holiday Decor PURGE of 2018! Hey there, happy Friday y’all. While many of you are doing some Black Friday shopping today, I decided it was time for a HUGE holiday decor PURGE. And I’m not talking a few trinkets here and there as I’ve done in years past. Nope, I’m talking about 60% of my Christmas decor! A major purge has been on my list to do for years and quite honestly the task felt daunting. All those decisions to make during a season that requires so much decision making already. Who can relate? 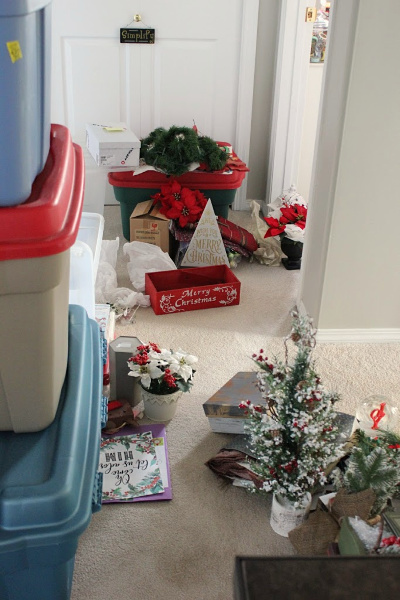 Who can also relate to the fact that decluttering holiday decor is so hard? I certainly find it hard. So many memories wrapped up with each item that it can literally be gut wrenching to part with some of it. My HUGE Holiday Decor PURGE of 2018! Over the years my decorating style has changed quite significantly though and as a result there are just a lot of things I am no longer using. I’ve moved to a more simplified decorating approach. I like to decorate for winter in October because we typically have snow on the ground already at this time and well Autumn decor just seems wrong when snow is falling outside. 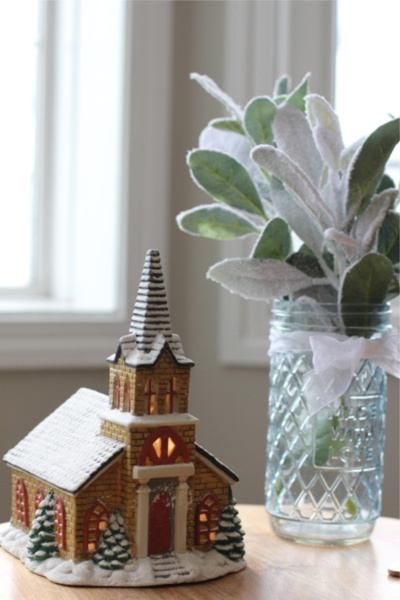 In the past I would then switch out my winter decor for Christmas decor at the start of December and switch back to my winter decor in January. The winter decor would stay up until the end of March which is when winter ends for us. Yes six months of winter is WAY too much! But all that decorating was just a lot. 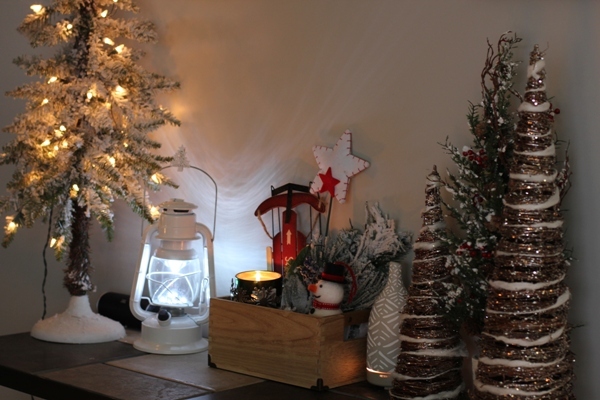 Plus I was simply running out of storage room between both the winter and Christmas decor. 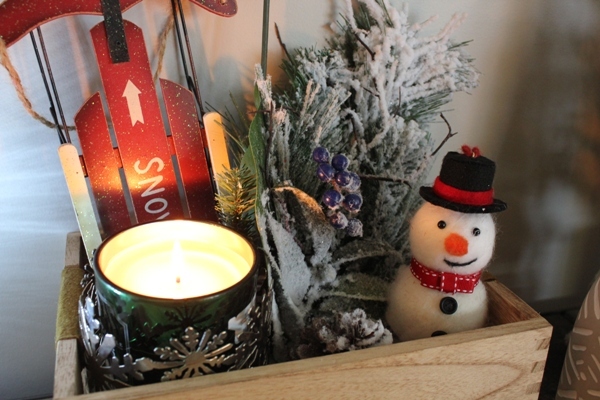 One of my winter vignettes. I hated that so much of my focus at Christmas was on the decorating and I just wanted to make things easier. So now I decorate for six months of winter and just leave it that way. I stick to flocked trees and snow related items. I make my home Hygge cozy with throws, candles, lanterns, twinkly lights and peaceful calming colors. There will still be a few things that go up in December like the Christmas tree and my nativity scene of course but otherwise I’m purging everything else not winter related. Most of my red items I purged and anything else that didn’t work with my simplified decor. 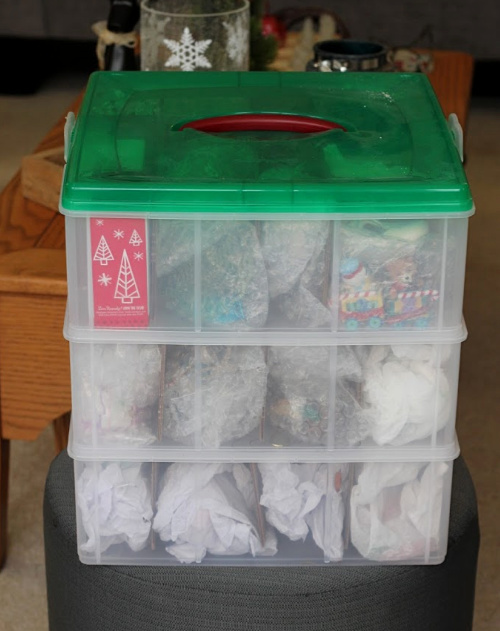 These are the bins of Christmas decor I started with. I brought everything upstairs and started going through each bin one by one. I asked myself several questions as I touched each item. Did this item fit the new winter vision for my space? Will I use it this year? Does it make me or a family member happy? Why was I hanging on to it? Would anyone miss it? Would someone else appreciate this item more than I do? Make sure you grab a box to use for donations! All was going well until I got to the dreaded village box. I have put off making a decision about the village stuff for three years. 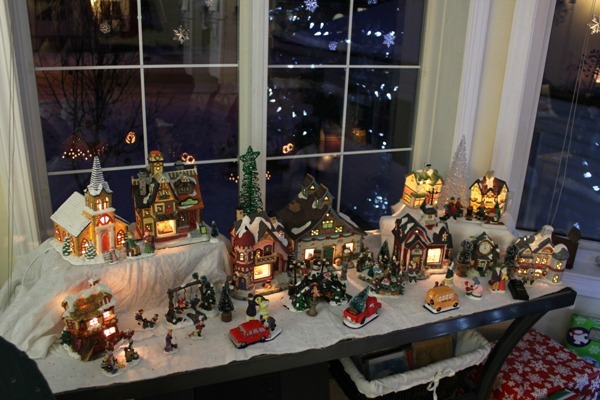 Every year since my daughter was a young girl she took great pride in creating beautiful scenes of all our village houses, trees and people. She would do such an amazing job and we all loved the lovely results. So what’s the problem? Well that daughter is now almost 22 years old and no longer lives at home. That’s a problem because now that my daughters out of the house the rest of us absolutely hate the process of setting it up. It’s such a chore! My youngest couldn’t care less and I am just tired of the time it takes. I absolutely love tradition though and so for the past three years I’ve continued to put it up in honor of my daughter. But this year I just didn’t have the energy for it. I texted my daughter to ask if she would mind if we got rid of the village and whether or not she wanted to keep any of the pieces. Her reply was quick. Nope she didn’t mind at all and nope she didn’t want to keep any of it. Well gosh why didn’t I ask her that question three years ago!! Off to the thrift store it goes! Sometimes traditions run their course and that’s okay. Don’t get so hung up trying to maintain one that is no longer serving your family. Let go of the pressure that comes with it and in the process you might even make room for new traditions that work for your current season of life. If not everyone agrees, it may mean calling a family meeting to find a compromise. Let the one who cares the most be responsible for it. If they don’t want to, then they don’t really care that much. A couple more of my winter displays. There is nothing wrong with doing and having less instead of more, more, more. Simplifying can be a very beautiful thing especially if it frees up time for the things that bring you the most joy over the holidays! So we are saying goodbye to the village and many other things no longer serving us well. Here is my HUGE holiday decor purge pile, woot!! So much stuff leaving my home. Some was offered to friends and the rest I’m donating to our local thrift store where all profits are used to support our local hospital. That makes me happy knowing I’m benefiting my whole community through my donation. 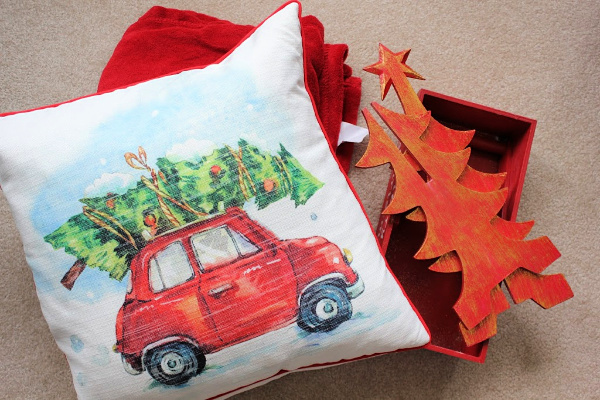 I also parted with super cute Christmas pillows because they take way too much room to store. Hard to part with but they alone take up almost an entire tub! Off they went to a friend. 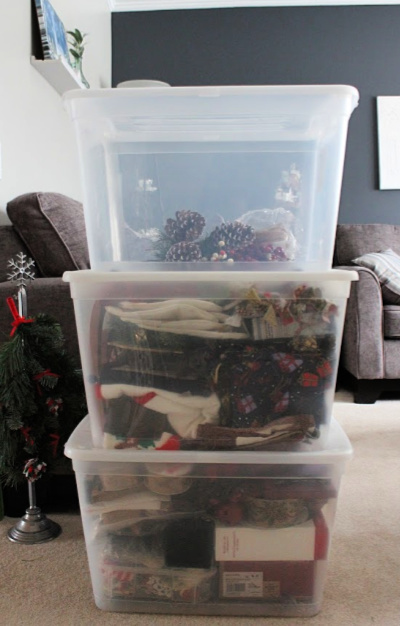 My goal was to get all my holiday decor down to four matching bins (to make storage easier) and I managed to get it down to THREE. Woohoo!! The space I have saved, and can be using for other needs, is incredible. I already had two of these white 80L bins and went out and purchased a third one from Canadian Tire on sale for $6.94. I like these particular ones as they have wheels to make pushing them around a little easier. The bottom one holds Christmas tree decorations, the middle the nativity scene, stockings, tree skirt and a few other random things. The top one is empty because I already have some decorations up. We buy our kids an ornament every year up until they are 18. We use this Snapware ornament storage case (affiliate link) to keep those organized. Each of my three kids gets a row. Works really well!! Change can be hard. Especially when it comes as a result of major life changes like kids growing up and leaving the nest. It is sad but it is also wonderful. I can’t wait to watch and experience the traditions that my kids take on and implement in their own lives with their own families. What joy that will bring me. Don’t get so stuck hanging onto the past that you miss the beautiful blessings of the present. 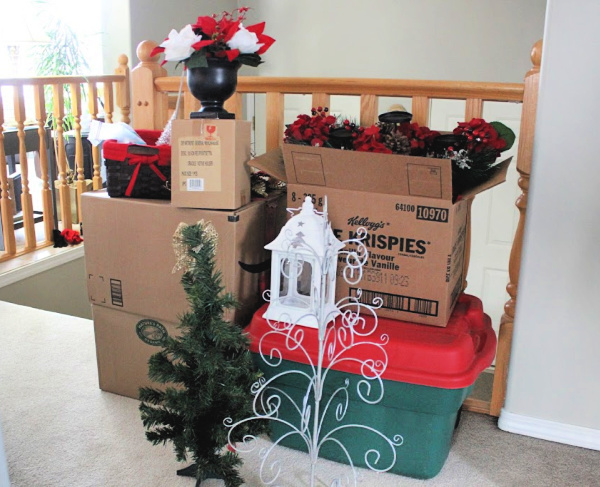 Do you need to do a holiday decor purge? Is it time to get it done? Don’t put it off, NOW is a great time to simplify!! What do you struggle to purge even though it is no longer serving your family? Why? 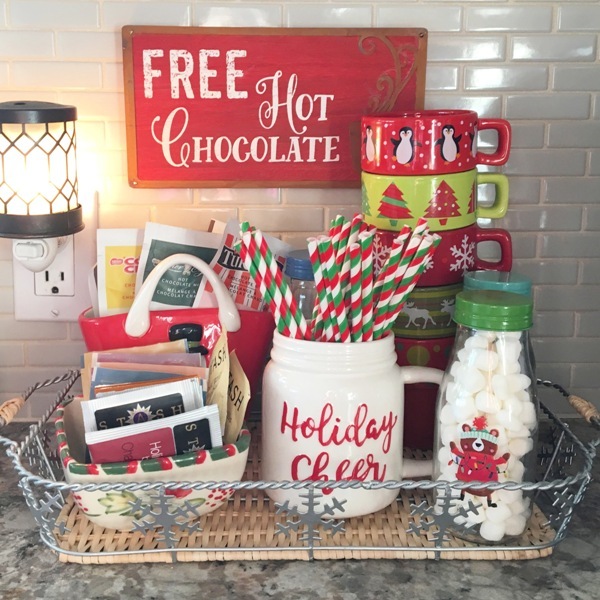 32 Responses to Declutter and Organize: My HUGE Holiday Decor PURGE of 2018! I needed to see this and I need to do it too! I notice I decorate for “Harvest” in the beginning of September and ow just add a few Halloween and then Thanksgiving pieces. 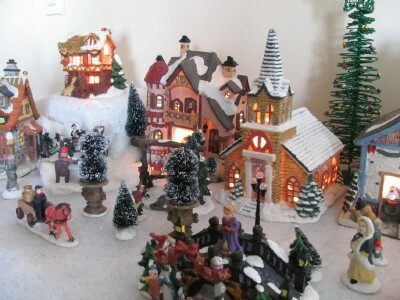 I think I will start to do the same as you and put up mostly winter and snowmen with a few Christmasy pieces added in. I also leave those up until Easter/ Spring. I probably have 8 Christmas tubs that could go! Thanks for the inspiration! Hi Rose! Oh I’m excited for you, let me know how many tubs you get it down to, woohoo!! I’m going to purge this year also. 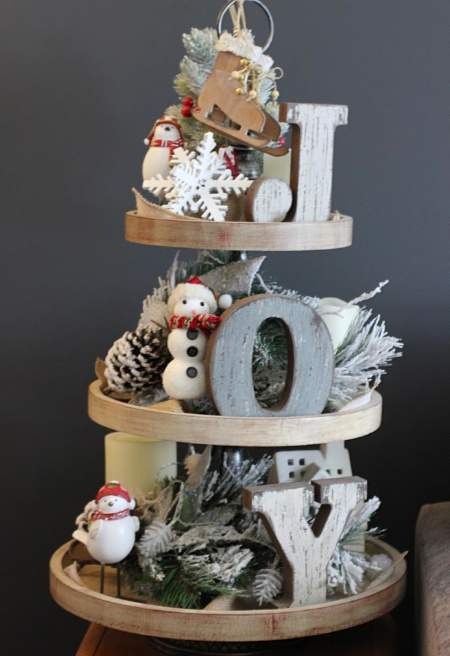 I love your JOY three tier display. It looks like a Christmas tree the way you’ve decorated it. I’ve been changing my home decor to be seasonal too with holiday touches added when they come around. Happy Holidays!! Thank you!! I purchased the tiered tray at Canadian Tire a couple of years ago on a huge clearance sale. I love how it turned out this year! Your article could not have come at a better time. I am at the point with that I have to purge and you have given me the motivation. My new motto is simplicity! It has been dragging me down. I have hung on to items thinking my daughter would like it for her home and children but no interest. I took items from my parents so as not to hurt feelings and now I am dealing with it all. Wish me Luck! Oh Nancy don’t be too hard on yourself. Now is a great time to start! You got this girl!! Please let me know how you make out. Congratulations, Laura! I too decorate for winter and Christmas, but am ready to simplify, starting with two adorable table top trees, full of mini ornaments. My sister claimed one (she passed me her old naked one, which I’m going to put outside on my steps, and the other is going to the charity shop. Can’t wait to dig thru additional boxes to pare down even more. Thanks for the early motivation! Yay! So glad my though process could help someone else!! That’s why I keep writing so thank you for encouraging ME!! I purged some decorations last year so when we pulled out the decorations yesterday, it was easier to go through. We have TONS of ornaments, as I,too, buy my kids one every year. I only have 2 kids but the amount of ornaments we have seems to multiply like rabbits every year. We have too many for our tree so what seems like half of them sit in the bin after the tree is done. But I know someday, (sooner than I think), my children will be out of the house and they’ll take their ornaments with them. So until then, I’ll continue to store the ones we bought on our honeymoon, etc. The ones that are special to my husband and I. Yes that’s exactly it Barb. So many ornaments will go with the kids when they start families of their own. There will come a day when I will miss my son’s Darth Vader ornament lol. I have my village collection from 20 years ago! I really need to let it go. I haven’t put it up since my kids were born which was 15 years ago! Why am I keeping it around? Thanks for this blog! Thanks so much Melanie! Good luck with the purging, high fives from me!! I feel overwhelmed with bringing out Christmas Décor also. I feel like I have a Christmas Tree and tonnes of décor. Sometimes I almost feel like it’s one or the other. So I put the tree on one level pretty much décor on the other. Less is always more to me now. Thanks for your post. I was thinking of doing this for at least two years and this was the nudge I finally needed! I had the same feeling as you about old family ornaments, feeling guilty to get rid of them, so many old memories attached but I still have the memories even if I purge the ornaments. Wow – Congratulations on your purge! I purged a lot last year – gave away my village pieces (not near as many as yours), nutcrackers and more. 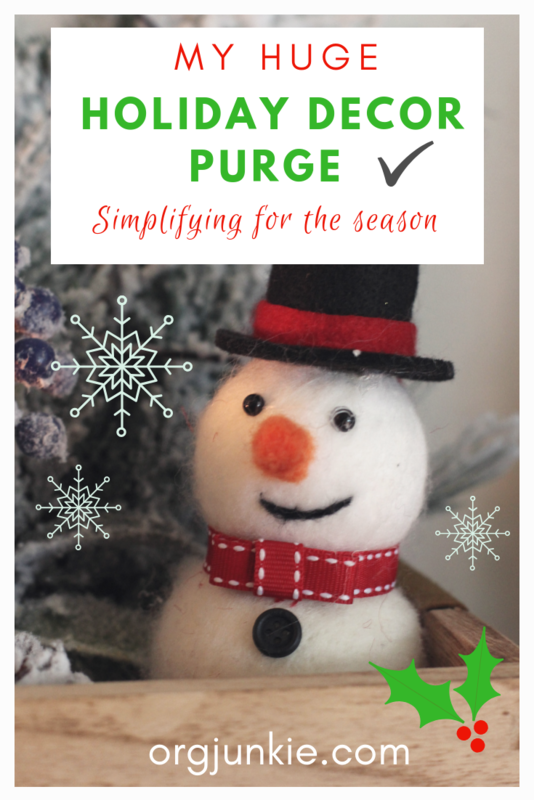 This year I’m going to purge again – things that I put out just because I have them, but don’t really enjoy. I help myself by thinking of the people shopping at the thrift store and finding my donations and getting so excited to find a “treasure” – makes it easier for me to donate! 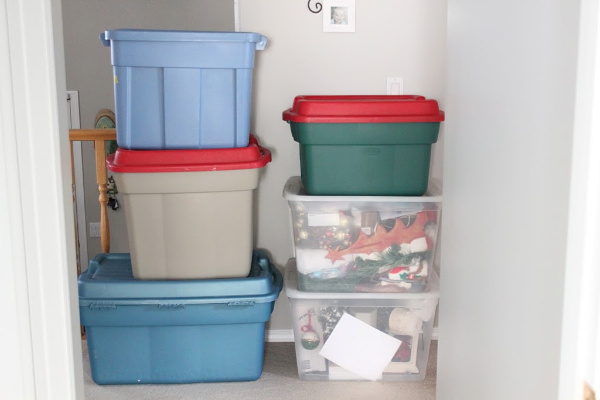 Double bonus – my husband is happy not to have so many bins to move in and out of the attic! Happy Holidays! 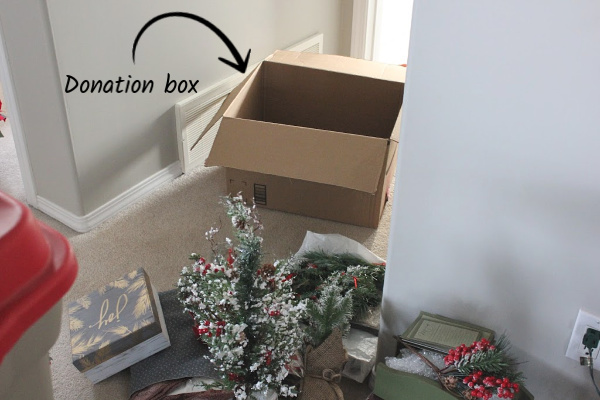 Good idea to purge Christmas decor. I think I’ll tackle that this year. So many old things i don’t put out and things my mom used to have need to go. I’ll be doing it next weekend. I like your ideas. Thanks! You’re welcome Becky, good luck with your purge! Great job on your purge! I also have a 22 yr old daughter ? and she has agreed to go thru all the decorations with me this week. I know there are some things she wants to keep for her own place but we have so much that I don’t use. 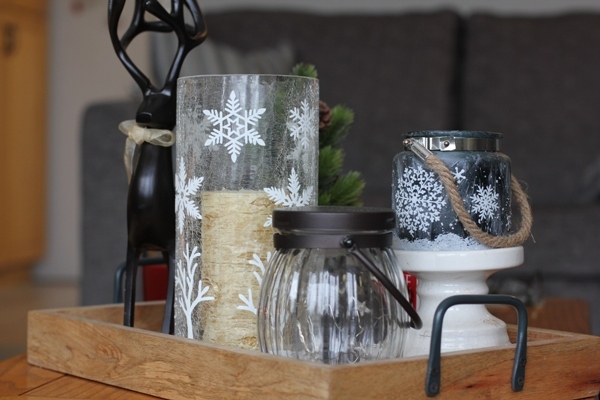 When you don’t enjoy the whole decorating process, it’s time to let go. I’m hoping to get rid of half of it this year?? I love this post, Laura, and your thought process as you went through the purge. How you analysed what worked, what you wanted, and what real life in Canada was like. I’m glad you kept the tiered JOY trays – I love that! Can’t believe K is 22! Time is moving so quickly. 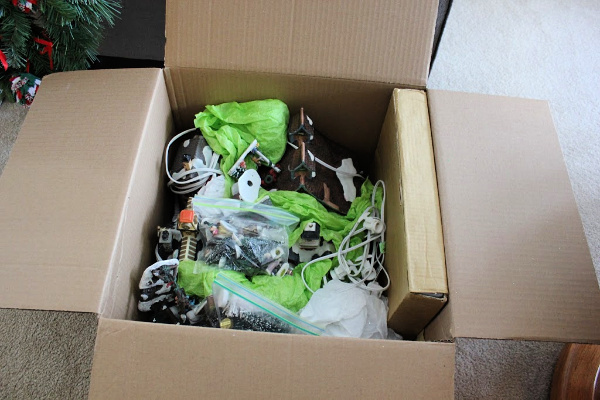 Me too, me too…..I need to do this….6 big boxes and my partylite collection have to be pared down. Have been doing little wee purges but you have given me the motivation to do it with gusto! Thank you soooooo much. Have a wonderful Christmas. A thought about holiday pillows. In order to reduce storage but still keep the fun (and what’s more fun than a cute pillow), keep only the pillow cases. Store them then put on pillows you have out to change up things for a season. Cases store flat and you get multiple use out of the original forms. Of course this may require some alterations to make them removable, but that is a project you can off until after the holidays.